Go into your /scripts/gk7_motd/client/ and open gk7_motd.lua with notepad. If you want to change the /motd command, you can if you go into /scripts/gk7_motd/server/ and open gk7_motd.lua with notepad go to line 16 and change "/motd" to "/yourcommand". please provide me other link. Adf.ly is blocked in my country. This is quite embarassing, I put that up for testing and didnt remove it. changed it manually and it works. Thanks! As a nice greeting and a small overview for new players this script is perfect, thanks for your work. Failed to load module gk7motd: Module can't be loaded because the path does not exist. 15:57:11 | [info ] | Loading script "server\gk7_motd.lua"
But it doesn't show up at the beginning, either when i write the command. Like Garry's Mod ULX Addon, can you put a URL from the interwebz or an HTML file from your computer into this MOTD? Hello, first of all thanks for your feedback. To your question, actually this what I had in mind when I wrote this script. 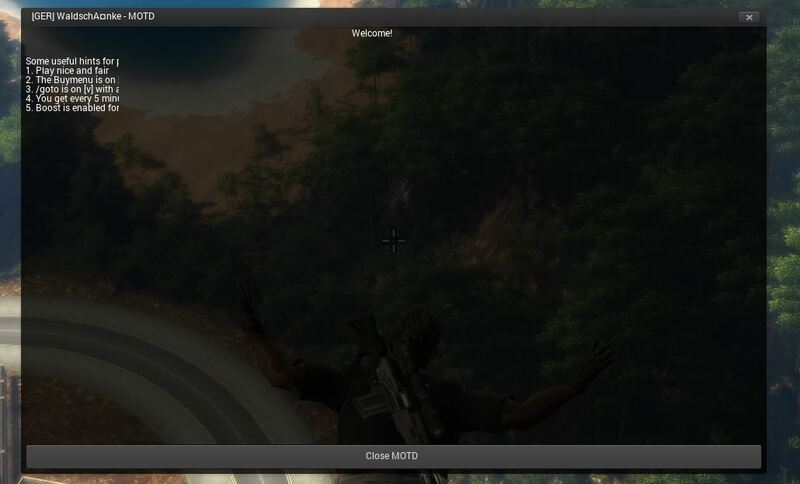 The problem is GMOD uses "their" vgui to do that(http://wiki.garrysmod.com/page/VGUI/Elements/HTML)and, as far as I know, this is not possible in JC2:MP. Can you post a screenshot of your script location? Nevermind, i'm sorry. I don't know why but when i reinstalled it, everything worked fine. I think that's because of bad format of the rules text i made. Thanks anyways and great script, good job! Also, i'm wondering if there's any way to insert links in there so i could add the steam group there and onclick, the steam overlay will came up with the steam group loaded up in steam browser. You can add a button (I think) which links your group, but having it in the window is not possible, as far as I know, right now.